Speaking of the new year and new beginnings - something managed to pollinate my Aloe aristata (or potentially itself an Alworthia cross or a Haworthia spp. 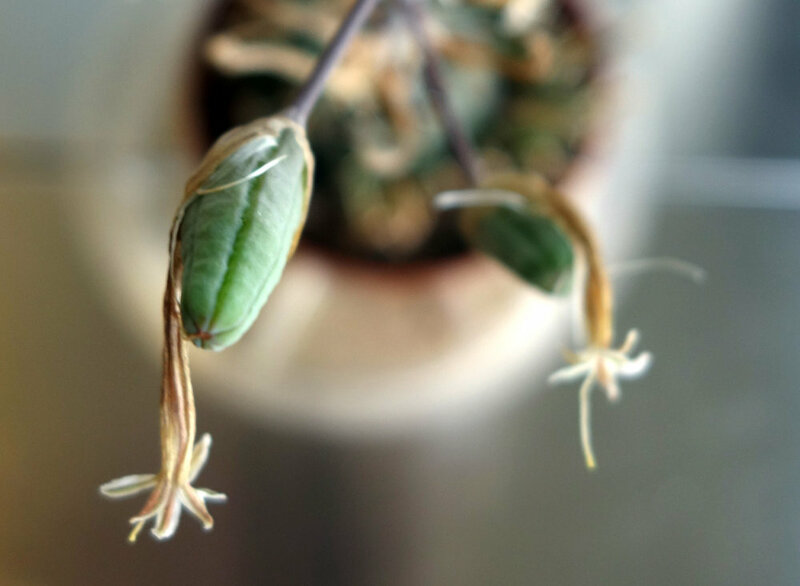 lookalike like Haworthia decipiens), and now I have seeds! I've never bothered to try to pollinate any of my Haworthia/Gasteria/Aloe flowers due to their long, thin throats, so this is a first for me. I plan to sow the seeds once all the pods have burst open. I slit a plastic cup in such a way that I fit it around the flower stem and covered it with saran wrap (with air holes) to try to catch the seeds, as the pods apparently explode with some force in order to scatter their goods far and wide. As you can see, one pod has already opened!